I've said countless times before and I'll say it again, unless Martha Grace's defect was picked up at our 20 week scan - she wouldn't be here today...she would have died before she was 4 days old as her Arterial Duct closed. We were lucky that we had the time to prepare, the time to search for the best possible treatment for Martha and that despite everything she's been through - she has been given everything possible to help her be the happy and cheeky two year old that she is today. Baby Loss Awareness Week took place last week. On Thursday at 7pm, thousands of people across the globe lit candles in memory of the babies they have lost. The 15th October is recognised worldwide as Pregnancy and Infant Loss Remembrance Day. My husband and I added our candle to the global wave of light, remembering our baby girl Grace who we lost to a congenital heart defect. of the most common birth defects – congenital heart defects (CHD). Heart defects affect 1 out of every 125 babies, making them the most common cause of birth defect related deaths in the UK. Shockingly, only 1 in 3 babies affected by CHD have their condition detected during pregnancy. Early detection of CHD saves lives. That’s an undeniable fact. However, at present, the 2 out of 3 babies whose heart defects are not detected during pregnancy have to take their chances. 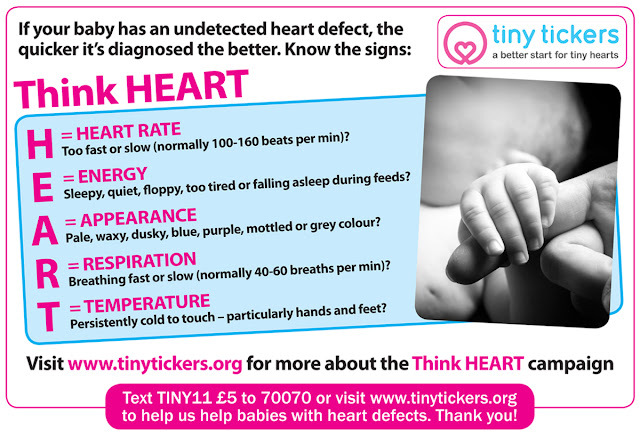 I am very proud to volunteer for a wonderful charity called Tiny Tickers, which aims is to improve the detection of CHD during pregnancy and give heart babies a better start in life. Tiny Tickers’ mission is entirely achievable and their methods work. At present, Tiny Tickers are training sonographers to be better equipped to spot heart defects at the 20 week scan. Statistics show that the training works – in the regions where it has already been carried out there are significantly higher detection rates of CHD. Tiny Tickers is a small charity with huge ambitions – to train sonographers all over the UK so that every baby with CHD has the best start in life. But they are not quite there – yet. Tiny Tickers have created a Big Tick card, which you can take along with you to your 20 week scan. It contains questions you can ask your sonographer to enable you to confidently discuss your baby’s heart health together. The Big Tick Card is completely free and can be ordered from visiting the Big Tick website here . It only takes a few seconds to order and doing so means that you will be well prepared with the questions you need to ask about how your baby’s heart is developing. In the vast majority of cases, babies’ hearts are perfectly healthy. But if there is a problem, spotting it at the 20 week scan will give him or her the support and medical care they need straight away. This means a better chance of survival. During my time as a volunteer with Tiny Tickers, I have heard many stories from new parents whose instinct told them that something was seriously wrong with their baby but who were dismissed by health professionals. For example, Grace Brown had voiced her concerns over daughter Honey’s health many times before her heart problem was finally picked up. 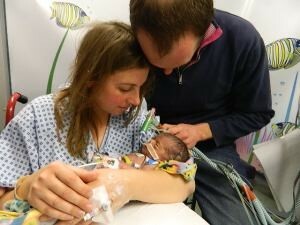 By the time Honey arrived at hospital she had already gone into heart failure. Luckily, her story has a happy ending (you can read it here). For more information on recognising the signs of CHD, please visit the Think Heart web page. My daughter, Grace, had a heart defect called Ebstein’s Anomaly, which was detected at my 20 week scan. In most cases, early detection of CHD gives babies a better chance of survival. Unfortunately Grace’s heart defect was so serious that, even with the most expert medical care, she didn’t make it. But, early detection meant that she received the best treatment available. At least when I look back now, I know that everything possible was done for her. Without the eagle-eye of the sonographer at my 20 week scan, it is highly likely that we would never have met Grace alive. She would almost certainly have been stillborn if my pregnancy had continued unassisted. Instead, we had a precious few hours with her before she passed away. Those memories mean the world to us. Tiny Tickers receives no government funding and is entirely reliant on the generous help of supporters to carry on with their life saving work. Regular gifts from their Heart Champions allow them to plan for the future and train more sonographers. £5 SENDS A NEW DIAGNOSIS PACK WITH SUPPORT AND INFORMATION TO TWO FAMILIES WHO HAVE JUST FOUND OUT THEIR BABY HAS A HEART DEFECT. 1 in 3 babies with CHD are discharged from hospital with no one knowing about their life-threatening conditions. Tiny Tickers needs as much help as possible to change this frightening statistic. 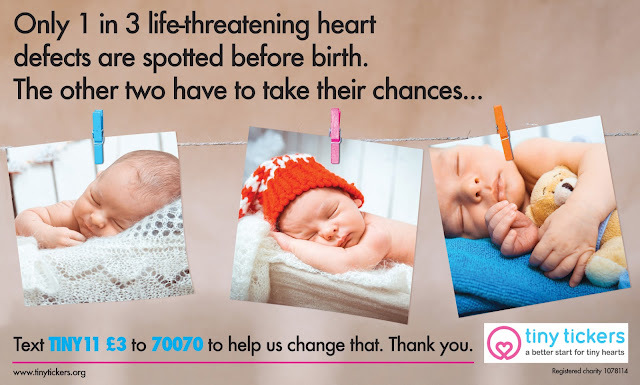 If you would like to become a Heart Champion and help Tiny Tickers continue their vital work assisting heart babies before birth, please click here to find out more.